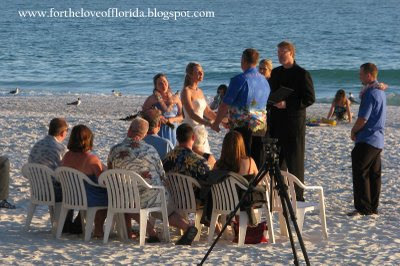 It NEVER occurred to me to be on the beach just to walk or sit or read or eat. Imagine. 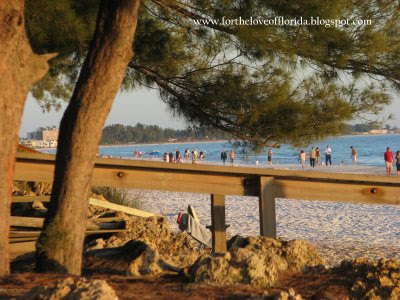 I live 35 miles from some of the nation's most beautiful Gulf Coast beaches. Only in the last few years have I learned how to breathe in every nuance of every aspect of the beach every chance I get. It doesn't matter to me now what kind of day it is or what time of year it is. And the thrill of it begins as soon as I get a glimpse of the open water. 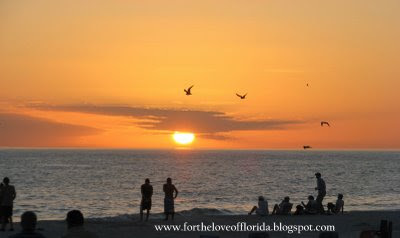 I admit the winter is fast becoming my favorite time for the beach. Well, it's right up there anyway with spring and autumn, too. Summer... only early and late. Okay, so I do have my limitations. You might be thinking about now that you've already seen these photos. Not so. 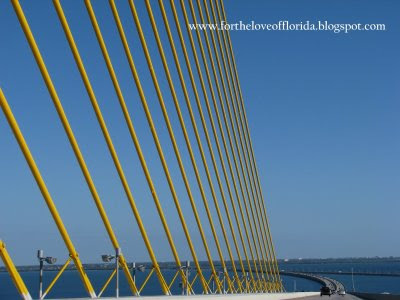 I just like to take photos of the Sunshine Skyway Bridge. That's right. Every single time I go over it. 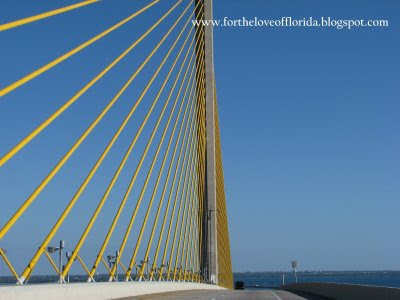 And in case you don't know from my last post about the Sunshine Skyway Bridge ... I really LOVE to drive over it. Mr. Meems got the big idea to drive over to the beach for dinner. How about that? He still knows how to get the most points with me. So much for economic downturn. We waited over an hour to be seated. To tell you the truth it didn't matter. 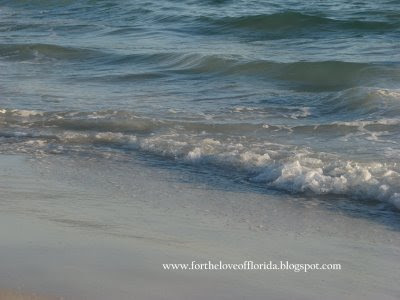 It gave me a chance for a nice long walk on the beach to clear my head. 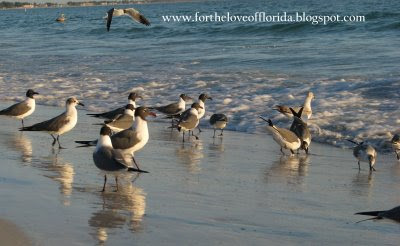 To smell the salt.To watch the birds.To hear children playing.To feel the water.To observe the changing sky. To be thankful. How about this for a dinner table! In the sand. On the beach. At sunset. Perfect. In case you're wondering that was another wedding party (with the arch) at the other end of the restaurant from the first one. Except for that bridge thing,it sounds like a perfect dinner.Maybe Mr.Meems could give lessons? I wouldn't doubt it one minute. More than likely crossed paths then and even possibly more recently... now that would be the hoot of hoots. 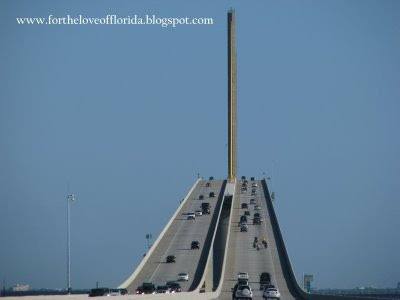 I agree about taking photos everytime you travel this bridge. It just calls for a person to do that. 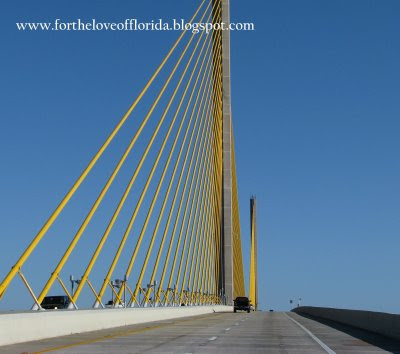 When I was there in Feb I made sunrise photos of the bridge from the bridge right as you enter Fort DeSoto Park. The sky was pink and the bridge was beautiful. I will get around to posting them someday. Meems what beach and what restaraunt. Looks great, what a table, sure can't beat that view. Oh, I can imagine the sight of the bridge from that vantage point. Our feet were in the sand and nothing in our way of the view. The timing was perfect, too. We sat down 20 minutes before the sun disappeared. 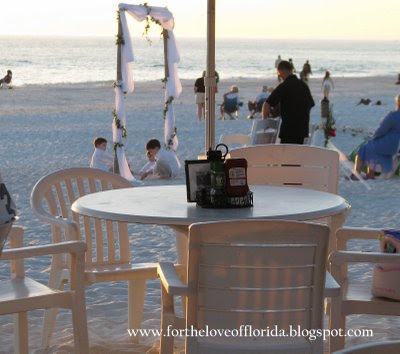 The outdoor gas heaters got turned on and we donned our jacket to shield from the light breeze of the gulf at nightfall. Did I say perfect? 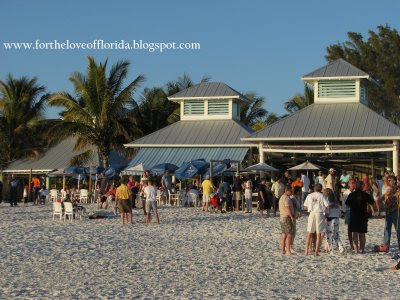 We were on Anna Maria Island at the Sandbar Restaurant.